For easy and fast group transportation in Milwaukee, Wisconsin, call Total Charter Bus. As the most-trusted charter bus rental company in the Midwest, we provide reliable transportation for groups of all kinds, no matter if it’s for a corporate event, school field trip, wedding, or private trip. We’re ready to help you 24/7! Call us at 414-877-1515 for a free quote today! Total Charter Bus is the expert in charter bus and minibus rentals all across Milwaukee. With access to the largest network of up-to-date bus rentals, we make planning group transportation easy, fast, and completely stress-free. We’ve helped groups find the perfect transportation solution for their corporate events, weddings, school trips, family reunions, and more, meaning we can easily help your group get to where they need to go. Our network holds a wide variety of bus options, ranging from compact minibuses all the way to full-sized coaches. Your group can ride in complete comfort with premium amenities like reclining seats, air conditioning, flat-screen TVs, on-board restrooms, and more, giving you the chance to sit back, relax, and let your professional driver handle the rest. 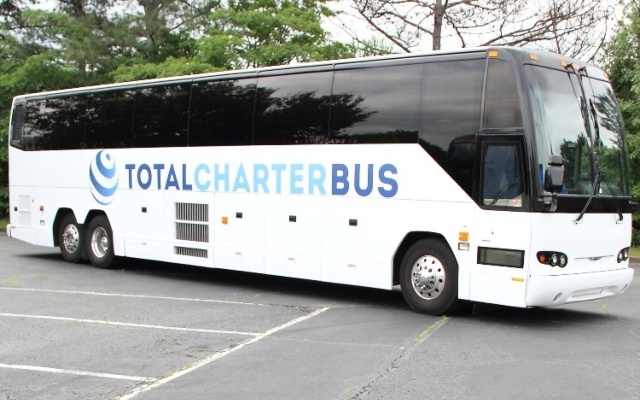 Planning a large-scale event is stressful enough, but Total Charter Bus can help make it easier with completely streamlined charter bus rentals for all attendees. From magical weddings at Renaissance Place 1451 to corporate events at the Wisconsin Center, your event will run smoothly and stay on schedule when attendees have a safe and reliable transportation the entire time. Keep students organized, on time, and comfortable in a private charter bus or minibus rental. While you ride to Betty Brinn Children’s Museum, students can watch movies on the TVs and stay entertained with WiFi and power outlets. Total Charter Bus takes safety seriously, and you will only be paired with a professional, licensed driver you know you can trust your students with. Total Charter Bus doesn’t just service Milwaukee-- we also help plan trips in major cities all across the Midwest. Planning a day trip to cities like Chicago, Detroit, Indianapolis, Minneapolis, and more is easier than ever when you work with Milwaukee’s best charter bus company. Don’t let tricky group transportation hold you back from your next trip. Total Charter Bus is ready 24/7 to help you find the perfect bus rental for your group. We’ll find exactly what your group needs within your budget. Call us today at 414-877-1515to see how we can help you!